One of the best works of fiction in any genre, in any language. (Yes, it's that good.) Capek takes on humanity itself and leaves no one standing. The lessons of his imagined catastrophe are chilling in their realism and as applicable today, 80+ years after it was written, as to centuries past. Smart, incisive, and most of all timeless. My only regret is that I didn't read this sooner. If that seems off-putting, it isn't. That's its genius. It not only "works," in that it tells a compelling story, you will see echoes of contemporary events that Capek couldn't possibly have predicted -- and not just looming catastrophes like the environmental crisis, but our current preoccupation with "fake news" and the cult of celebrity. Imagine yourself writing a book as elegantly applicable to the year 2100 as to today. That's the achievement. 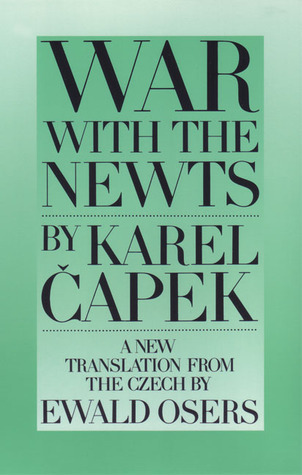 Sign into Goodreads to see if any of your friends have read War with the Newts.